When artist, Jeremy Deller, was invited by Modern Art Oxford to examine two of his artistic heroes in an unconventional exhibition that draws surprising connections between these two iconic cultural figures, few could imagine the result. Upon viewing, it’s clear they have much more in common than we might suspect. As a 20-year-old art history graduate, Deller had a chance encounter with Andy Warhol in London which led to an invitation to visit Warhol at the Factory in New York. Deller spent two weeks just hanging out watching Warhol work. “It felt like there were things happening all the time, but it was a relaxed environment with a purposefulness nonetheless. You never knew who was going to walk in. He surrounded himself with people – people with different skills who had ambition and creativity.” Deller describes William Morris as the “Warhol of his day” trying to revolutionise the alienating world of industrial work by the means of soft furnishings and floral wallpaper. Warhol and Morris both established printmaking businesses, both envisaged art as not something done alone, but through collaboration. Both wanted art to be for the people, not a pampered few, and both men definitely made stuff happen. The exhibition looks at common interests that both artists shared across different periods of history. Themes covered are: mass population of contemporary art, design process and manufacturing techniques, shared mythologies and obsessions, along with politics and publications. 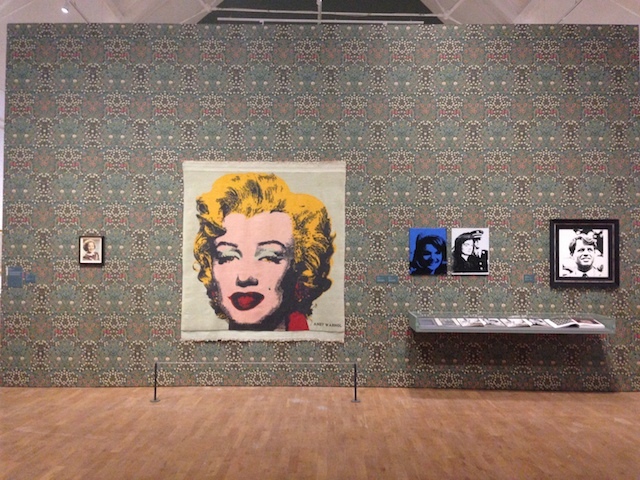 In one room there are Andy Warhol’s famed portraits of Marilyn Monroe, Joan Collins and Elizabeth Taylor alongside Willam Morris’s Holy Grail tapestries. Warhol’s obsession with celebrity is apparent through the letters and autographs from famous actors that the artist collected as a child, including his most treasured possession: an autographed photograph from Shirley Temple. A range of vintage Interview magazines (the publication established by Warhol in 1969) is in perfect contrast to Morris’s interest in medieval legends and iconography shared with artists like Dante Gabriel Rossetti and Edward Burne-Jones. Both artists’ interest in the politics of their respective times is explored through screen prints by Warhol drawn from newspaper cuttings alongside Morris’s strident items, including his membership card for the socialist league as well as pamphlets and correspondence. 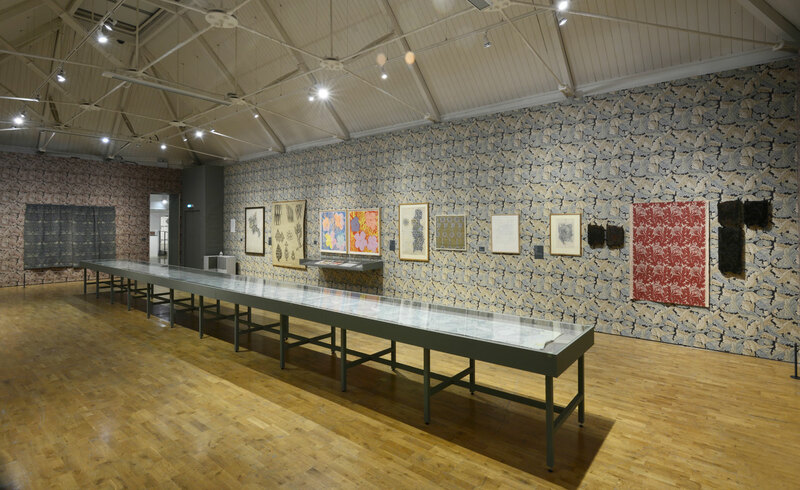 Repetition is a key theme; decorative patterns of Morris’s textiles, fabric swatches and wallpapers are contrasted with Warhol’s Flowers paintings and works on paper depicting soup cans and dollar bills. What becomes increasingly apparent, is that neither artist was satisfied with just one discipline. They both wrote, published and, in their embrace of commercial and fine art, had a massive influence reaching far beyond the art world. 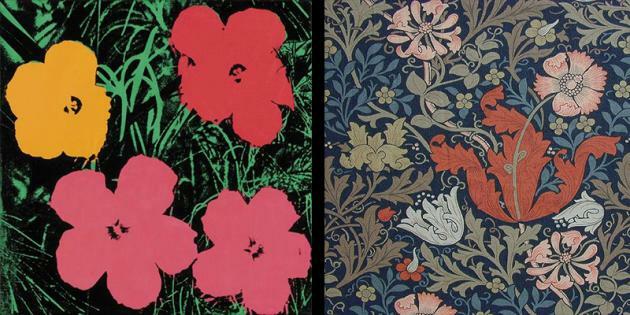 Love is Enough: William Morris & Andy Warhol run to 8 March 2015 at Modern Art Oxford. You are currently reading Love Is Enough: William Morris & Andy Warhol – Jeremy Deller at Modern Art Oxford at a kick up the arts.